A black and white large format negative of a Bell Telephone truck stuck in flood water under a bridge by the Subway Trailer Camp. In this view a tow truck is pulling the Bell Telephone truck out of the flood water. The subway trailer camp is located on the north side of Dundas Street at 1010 Dundas Street East. It is immediately east of the "subway" where the CPR crosses Dundas Street, near Anderson Street. It was established as a camping and tourist ground in the 1920s or 1930s and became a trailer camp in the 1950s. 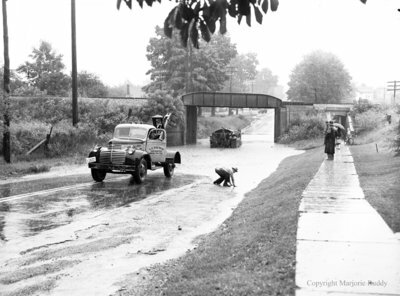 Bell Telephone Truck at Subway Flood, July 17, 1951, Marjorie Ruddy. Whitby Archives A2013_040_240.